Both my a/c fan (driver's side) and cooling fan (passenger's side) gave up the ghost within a few days of each other. I've searched here for information regarding the typical cooling fan failure modes, and I understand that as they age, the bearings dry out and wear, eventually resulting in seized fan motors. Maybe that's what happened here, but bear with me as I explain the circumstances of the failure. I noticed that my temperature gauge was reading higher than normal (usually runs 20 past the hour) when sitting in traffic with the a/c on. Never mind the fact that it's been as hot as homemade sin in the Baltimore metro area this week. Yesterday, I was driving to Annapolis, MD from Harrisburg, PA, and noticed that the temp was edging up even with the a/c off. I recently did a headgasket job so I've been hyper-vigilant about engine temperature. 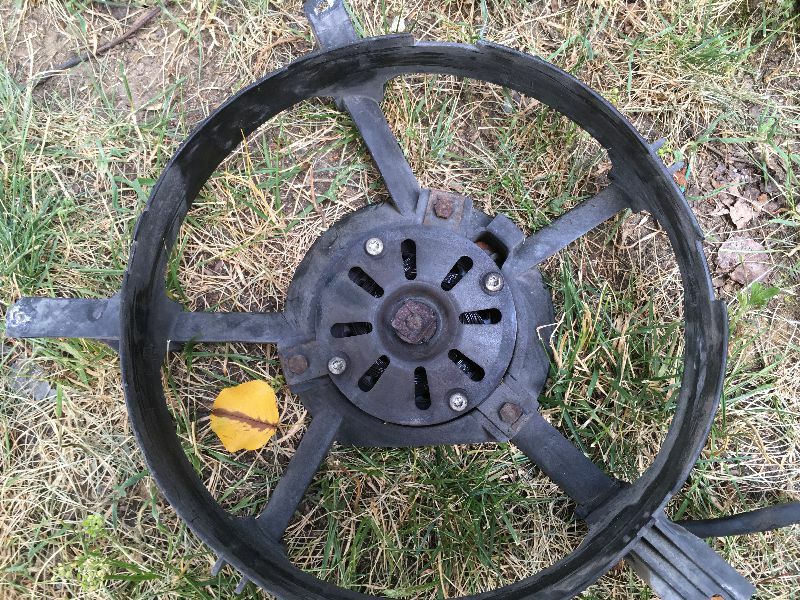 Maybe it was a coincidence, but on a couple long descents on I-83 I caught a strong smell I usually associate with overcooked brake pads, and my foot wasn't near the brake pedal. 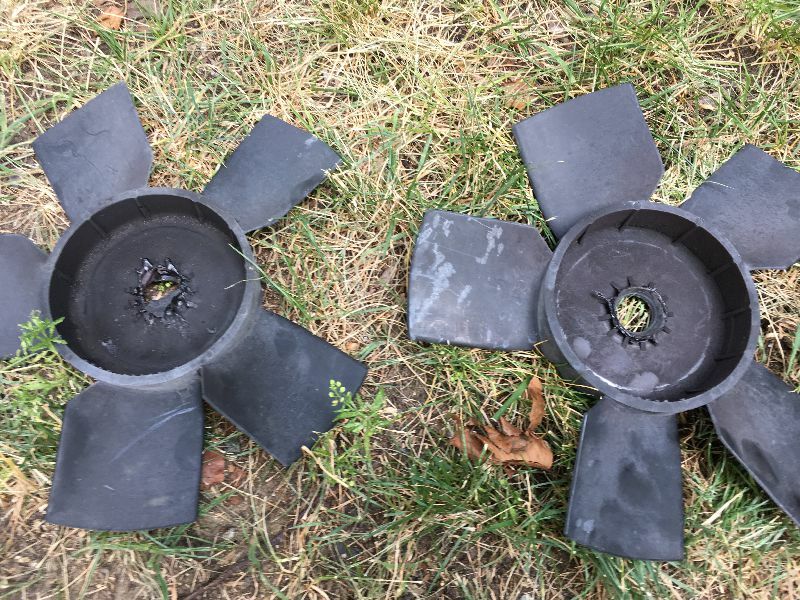 You can see from the photos in my gallery that both the fan blade hubs were "wallowed out." The a/c fan blade assembly was just sitting loose in its frame, while the cooling fan was completely seized - see the motor with the melted material around the shaft and clip. 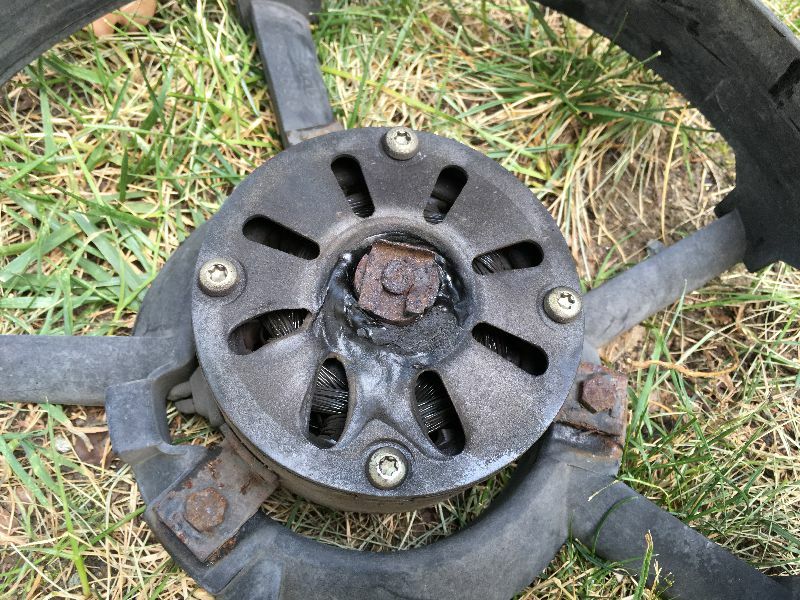 Maybe the brake pad stink was the bearings melting the fan motor housing, but why on a descent? I can't rotate the a/c motor by hand, but it will spin and sound like box of rocks when I hook it to a 12v power source. Prior to the fan failures, I noticed heavy RPM drops as the alternator picked up the load when either fan switched on. The car came close to stalling and actually did stall on a few occasions. I chalked this up to aged leads from the battery and alternator that are on my list to replace. To sum up, I've ordered the appropriate used replacement cooling fans. My question is whether or not the failure I experienced is typical given they are 25 years old? A follow up question is whether this is indicative of reduced radiator cooling efficiency (should I replace the radiator when I'm in there with the fans). Car is a 1993 Turbo with 188,000 miles. ->Posting last edited on Thu, 5 Jul 2018 15:48:45.